We’ve all heard those words; it’s a sentence that swallows your hopes and crushes your confidence. Getting ideas or projects approved and securing the resources needed to implement them is one of the greatest challenges business leaders face. With multiple stakeholders, constrained budgets, and competing agendas, it’s difficult to cut through the clutter and garner the required support. Do less work, hold fewer and shorter meetings, and get ideas approved on the first pass? Sign me up! By using the methods in The Elegant Pitch, you can get to “yes” more quickly and drive the results that set you apart from the crowd. 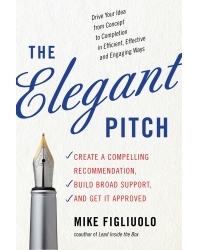 Mike Figliuolo, is the founder and managing director of thoughtLEADERS, LLC, a professional services firm specializing in leadership development. He’s helped thousands of leaders at the world’s most recognized companies learn to communicate more clearly, concisely, and convincingly. Mike has taught these approaches across industries, including pharmaceuticals, financial services, consumer goods, professional services, high tech, and healthcare. He is the author of One Piece of Paper (Jossey-Bass) and Lead Inside the Box (Career Press), and a nationally recognized speaker, trainer, and blogger. Mike is an honor graduate of the United States Military Academy at West Point and served in the U.S. Army as an armor officer. Before founding his own company, he was a consultant at McKinsey & Co. and an executive at CapitalOne and Scotts Miracle-Gro.